” Tourism is not an easy industry to grow and develop as many people and countries might think or expect. In fact it can be a daunting and, at times, difficult industry to be involved in if you don’t have the right advice, proper support, a good kappreciation and sensitivities of others’ cultures, government support, and of course capacity and resources, to start with. Governments that have realized and seen the potential to add substantial tourist dollars to their GNP have developed elaborate policies and support to public and private corporations to promote the industry in a big way. 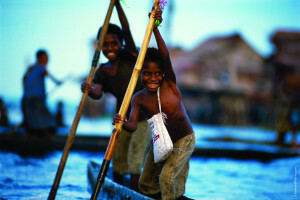 In this venture and adventure local communities who are the custodians of their environment, interesting natural attractions, historical sites and indigenous arts and cultures must see some benefit in the development of tourism by the government and the private sector through tour agents and operators. 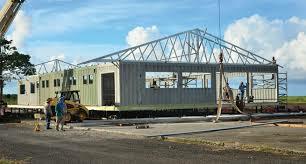 Developing what Bougainville offers, step by step and not en masse is the most sensible approach with VAs. 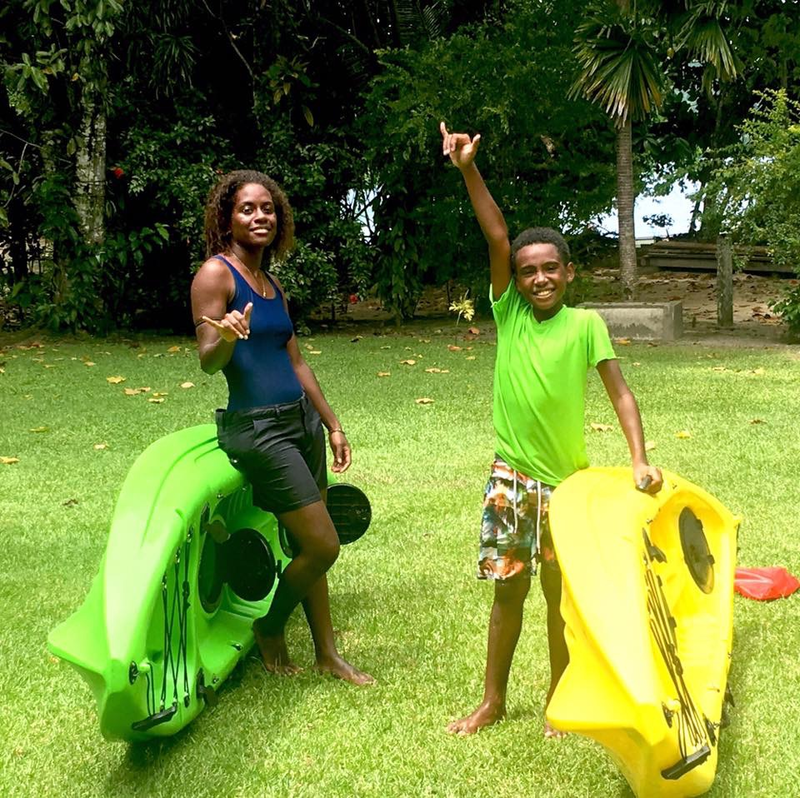 Tour companies and local operators and agents can pick and choose with local communities what is on offer regionally and locally around the Island. All that begins well ends well means a lot. 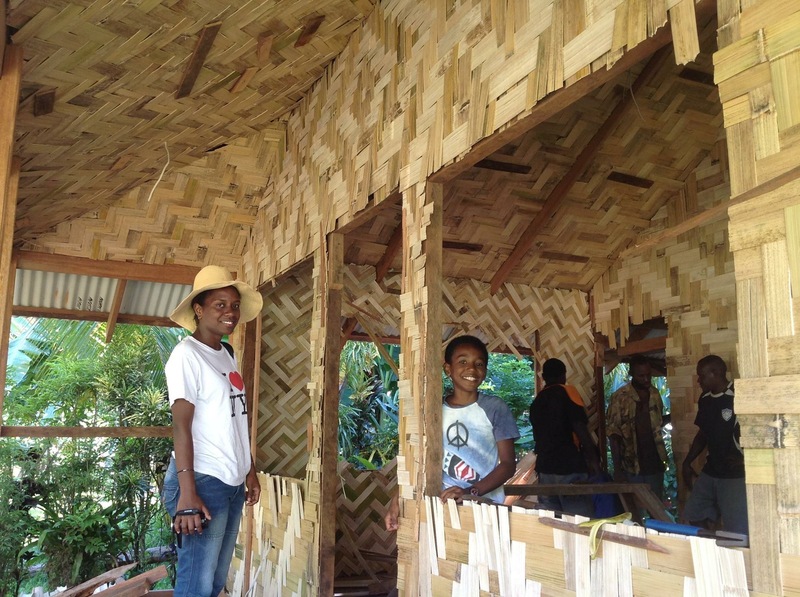 For Bougainville every little successes in this industry is important. The adage which goes something like, “to succeed we must know what we are doing and we cannot be too satisfied until it’s done and dusted”, is true, isn’t it? 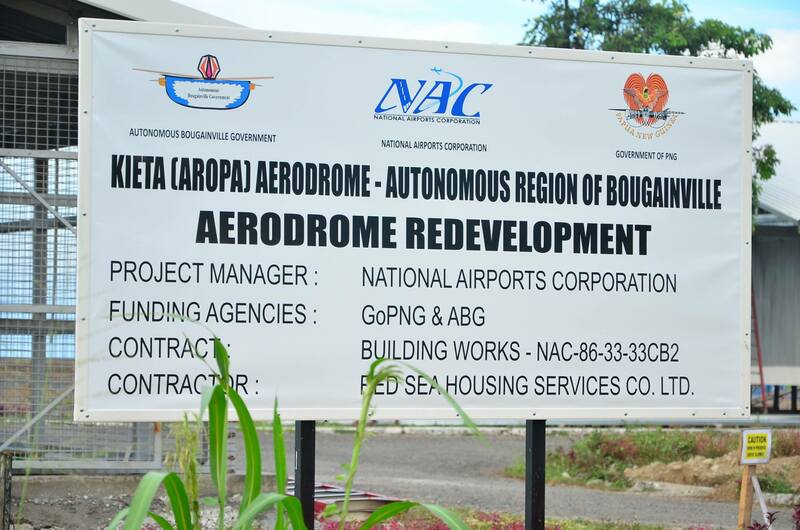 The advice we often hear how best to rebuild Bougainville is to build from the ground up is equally true, isn’t it. For starters and from experience it is a good advice to start and keep things simple, affordable and manageable from the start. This involves listening to industry experts, not being afraid to ask questions and have early meaningful discussions and consultations with the buyers of the product we are trying to promote and sell. A successful tour or promotion is a win-win outcome for the travelers and the communities visited, including service providers. The win-win formulae requires proper consultations between all parties involved in the arrangements in advance. This gives everybody a breathing space as no one is choked or shocked not knowing what is happening, who is coming and going, how the community is involved, how the benefits are shared and there are no surprises and disappointments. Bougainville is a good product to promote. 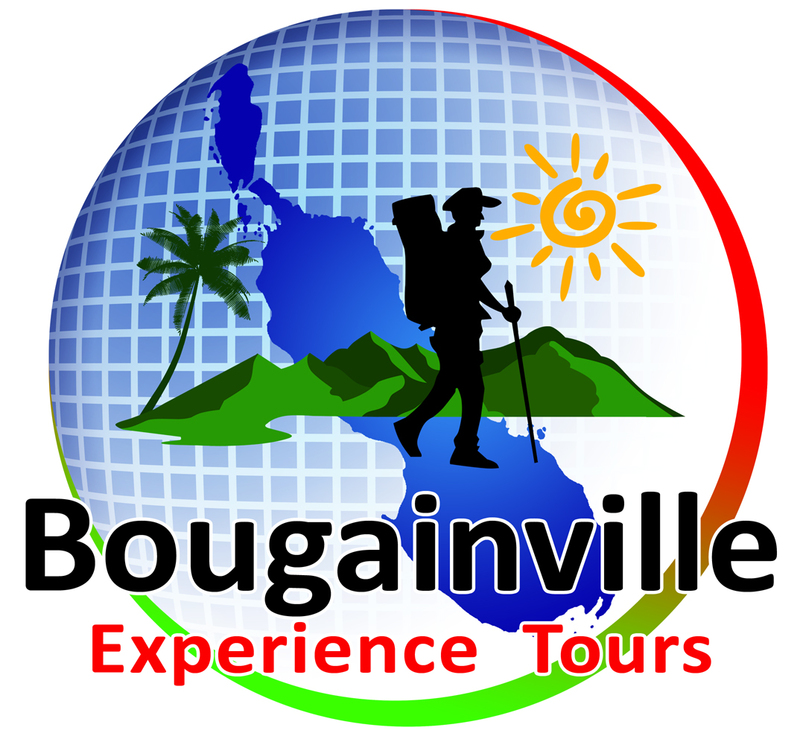 Areas all over Bougainville in the North, South and central will surpass expectations of any traveler if these are promoted sensibly and not just for the sake of quick profits. 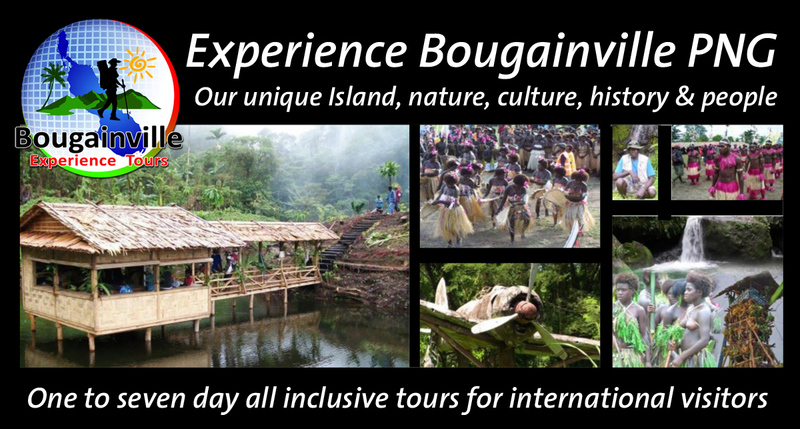 Slowly but surely we can all contribute towards a sensible policy discussion and a well construct for tourism for Bougainville. 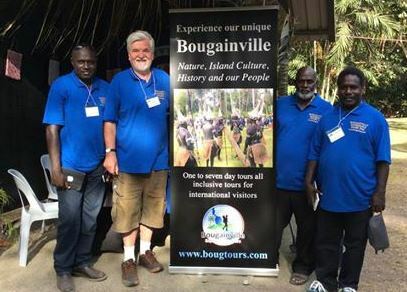 More than that, on this first occasion we thank Bougainville Experience Tours for gracing us with three cultural groups from the mainland, prearranged and prepaid to perform for the travelers and crew on the cruise ship True North. If anything else it does a lot and speaks volumes in familiarizing and promoting unity and union between and amongst different cultural groups from different areas in Kieta district. When we look back this is a win-win formulae as it spreads the benefits directly into communities. 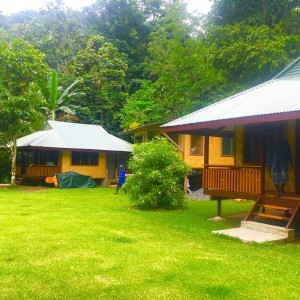 The early meaningful tripartite consultations which started more than five months ago between North Star Cruises Australia, Bougainville Experience Tours and Chief Peter Garuai of Pokpok and Uruna Retreat venue owners on Pokpok meant that every “i” was dotted and every “t” was crossed as much as it was practically possible to do so. There will always be issues and hiccups to sort out when a number of parties and groups are involved in trying to achieve something together. We must be prepared to put a positive spin to any differences and challenges faced. When dealt with and addressed sensibly challenges more often than not opens up opportunities to try harder to do things better for even better results. The True North is expected to make another visit in December 2017. 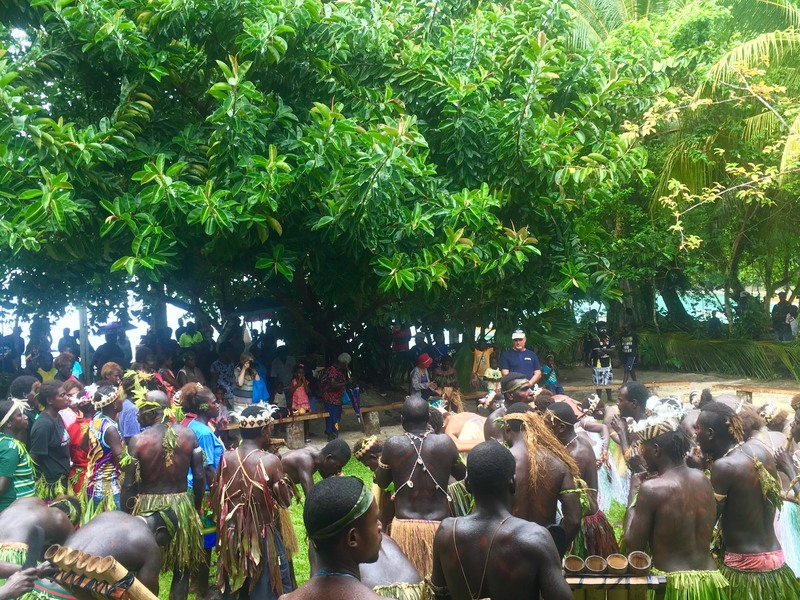 With a population of tourists and crew of over thirty, everyone was treated to a cultural extravaganza provided by four cultural groups. It was a real cultural smorgasbord treat from entree to desserts. The liqueur was back on the boat at the end of three hours of entertainment. 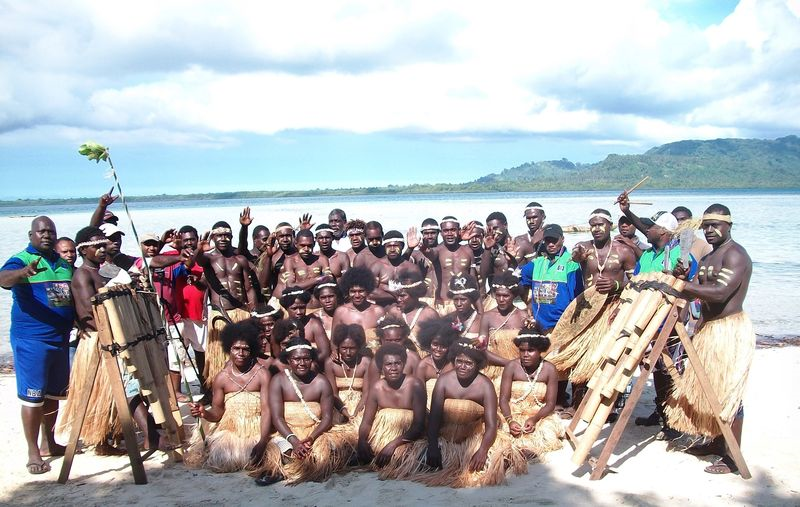 True North and Bougainville Experience Tours chose to visit Pokpok Island on this the first travel to Bougainville. 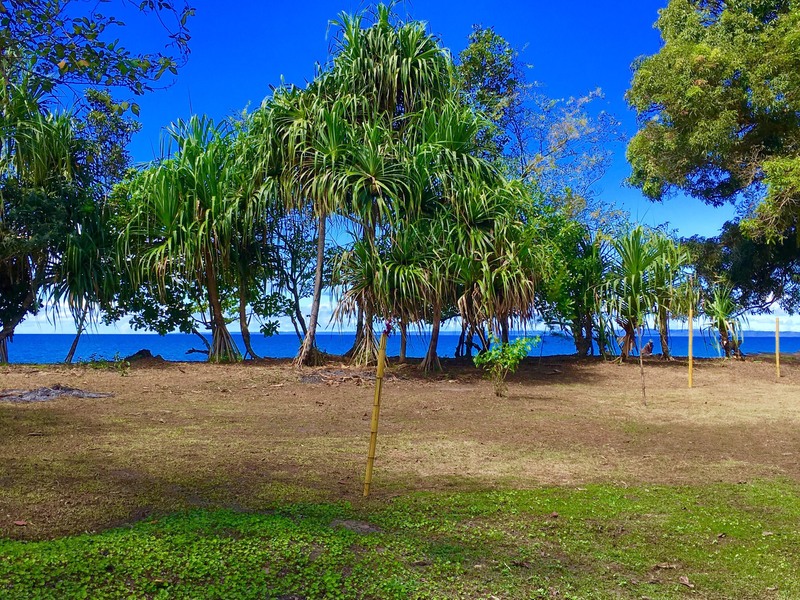 The deal was sealed when Uruna Bay Retreat on Pokpok agreed to provide the venue for the performances in its secluded beachfront property for the day. It was a real success, a win win for everyone that was involved in the visit and the cultural groups and other local service providers. 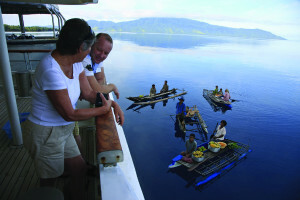 It is hoped that True North will include Bougainville in its annual calendar of cruises to this region of the Pacific. 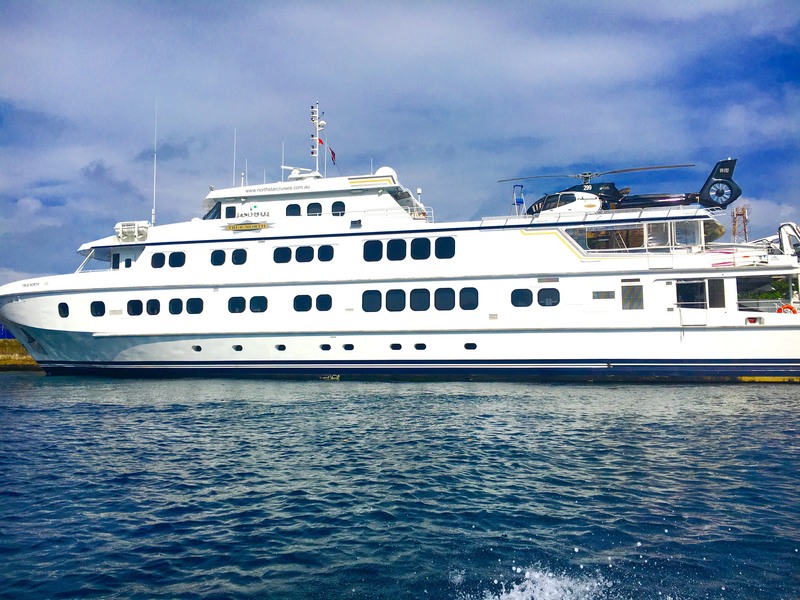 There is tremendous potential for other smaller cruises. 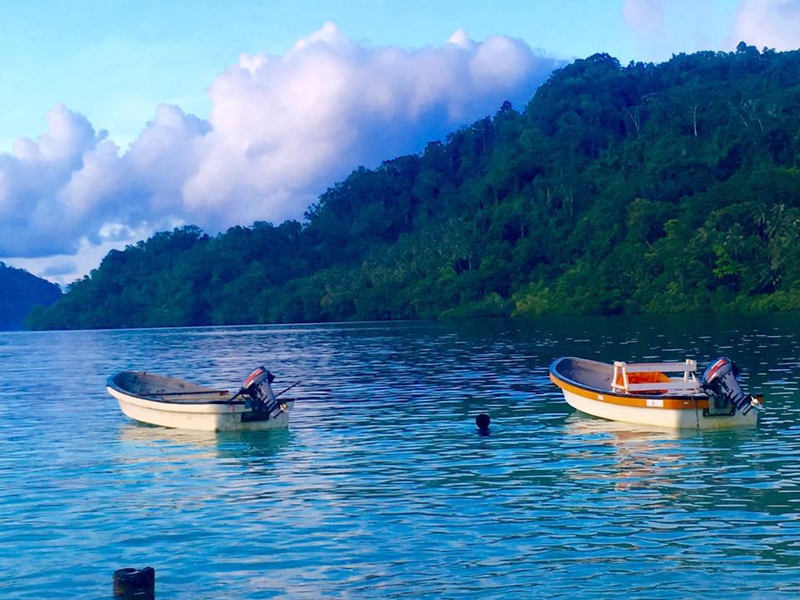 It is being quickly realized by travelers that the Kieta coastal area and Islands is a jewel in Bougainville’s tourism crown for cruise ships offering breathtaking views, scenery, white beaches, diving, snorkeling, a growing surfing interest and one of the most beautiful natural harbours anywhere. The World War II crash site of a military plane carrying Japanese admiral Isoroku Yamamoto, who masterminded the 1941 attack on Pearl Harbour, has been opened to visitors in Bougainville for the first time in more than five years. Yamamoto’s plane was gunned down by allied forces in 1943, sending the Mitsubishi G4M ‘Betty’ crashing down into the thick jungle of Papua New Guinea’s autonomous Bougainville region. Access to the site at Kokopo village, in the region’s Buin district, had been closed due to a land dispute between rival clans. 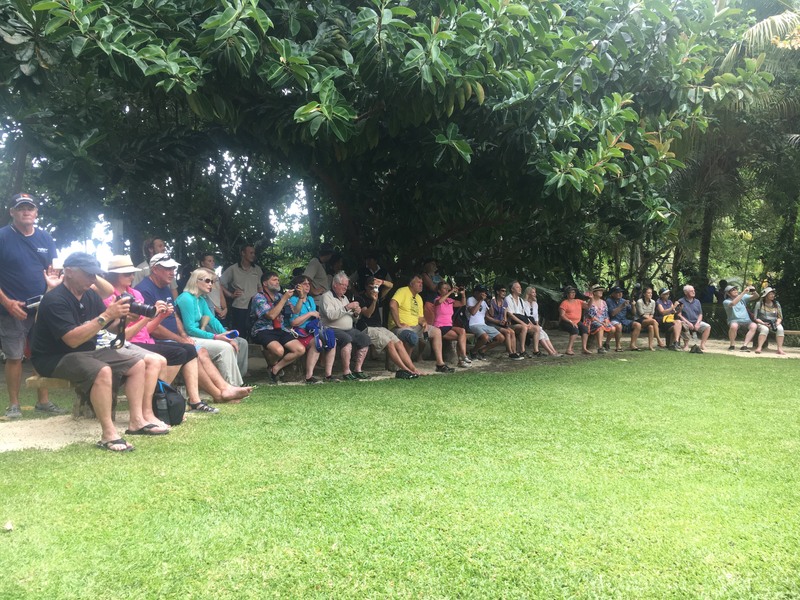 But the area recently reopened, with local tourism operators hoping this year — the 70th anniversary of the end of the Pacific War — would result an increase in the number of international visitors. “The plane is still sitting there in the jungle. 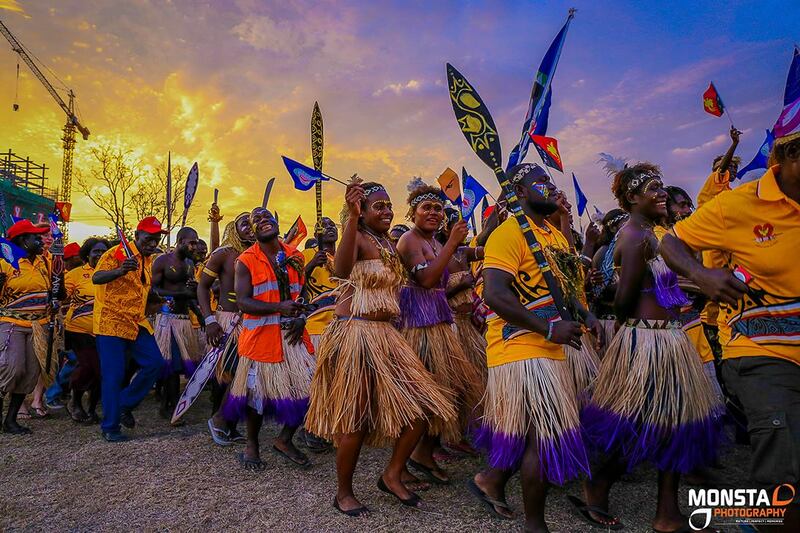 But at the moment, the people there have made gardens close to the site,” Zhon Bosco, owner of Bougainville Experience Tours, told Pacific Beat, adding the area was being cleared. Interest in the war strategist and Japanese navy commander is as strong as ever, particularly among the growing number of Japanese tourist travelling to the Pacific to learn more about their military past. “For Japanese people, it’s one of the most significant World War II history sites around,” Mr Bosco said. He said visitors would not be deterred by the long travel time or land disputes surrounding the crash site. “We have a network with the locals. 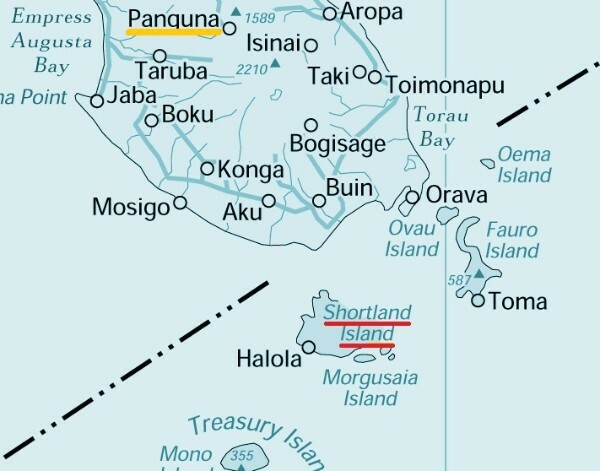 For Yamamoto crash site, we have connection with them so every time when people want to go there, we tell them there are people coming in, so they prepare themselves,” Mr Bosco said. Yamamoto is remembered for his role in the attack on Peal Harbour in the US, which left more 2,400 Americans dead and another 1,000 people injured. 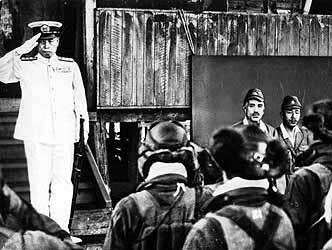 “Yamamoto is the most exalted hero in the imperial Japanese navy’s history. And he’s been untainted by Japan’s defeat, and he’s been untainted and any hint of war crimes,” US naval historian Mark Stille said. Yamamoto was instrumental in planning the attack on Pearl Harbour, which was not a strategic priority of the Japanese navy until he agitated for it. “Here’s a man who thought he knew the American psyche. He thought that by — putting it simply — sinking a few battleships that he would shock the Americans into a negotiated peace,” Mr Stille said. “Of course the exact opposite thing happened. Had the Japanese stuck to their strategy, perhaps occupying the Philippines on their way to Malaysia and Singapore, and the areas down south, that they had to have for the oil they needed to break the US embargo. Yamamoto was shot down after American code-breakers found out he was planning to visit troops stationed off Bougainville. 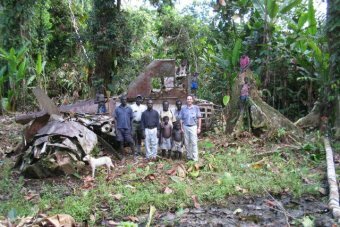 After 10 years of closure, Bougainville’s iconic World War II relic has reopened to tourists. 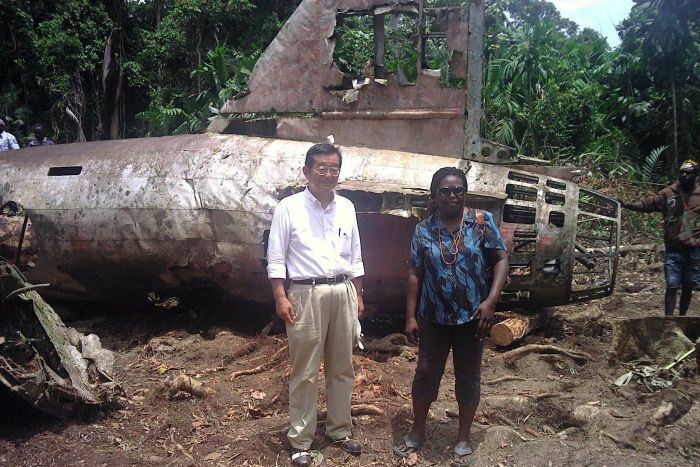 The crash site of the Mitsubishi G4M ‘Betty’, which carried the Japanese Admiral Isoroku Yamamoto, is located at Kokopo village of Makis Constituency in Buin District. 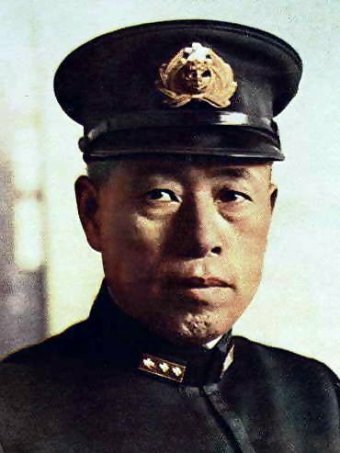 Admiral Yamamoto was one of the Japanese masterminds of Pearl Harbor attack and was gunned down with his war plane on 18 April, 1943 by US forces, causing his plane to crash south Bougainville. 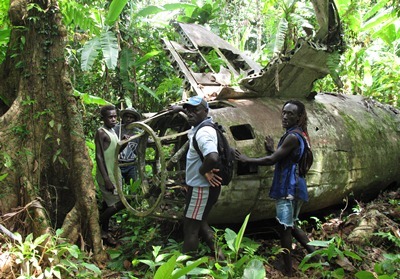 According to the landowners Chairman Mr Raphael Bakiri, before the crisis the Yamamoto crash site was one of the hottest tourism spots in Buin District. He stated that the place took in many tourists every day and the villagers now want to revive that. 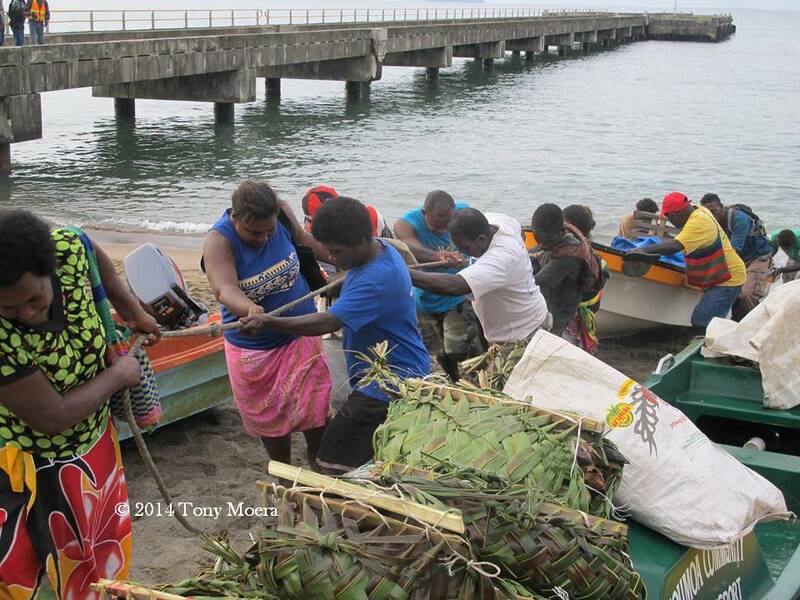 “The place was very restricted because it is on the border of two clans,” Mr Bakiri said. 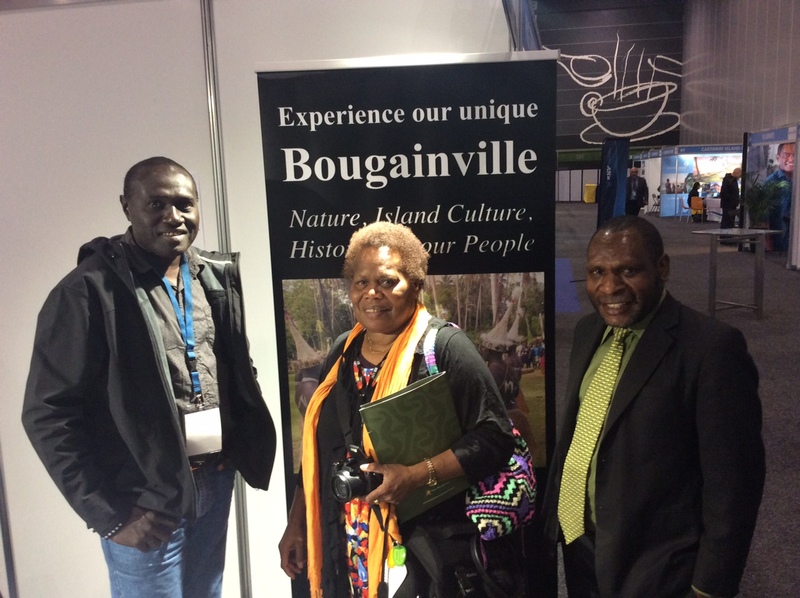 Chairman Raphael Bakiri standing at the side of the Bougainville Experience Tours hire car with Steven Tamiung of Bougainville Experience Tours. According to Mr Steven Tamiung of Bougainville Experience Tours (BET), the first Japanese tours will visit the Yamamoto site in the month of April. These are Nichibu Research Group who is already booked with BET to do a four day tour and Yamamoto site is their priority site to visit. BET also stated that more interested requests for the site are coming in. One confirmed for June and July is Japanese Homestay documentary filming group. 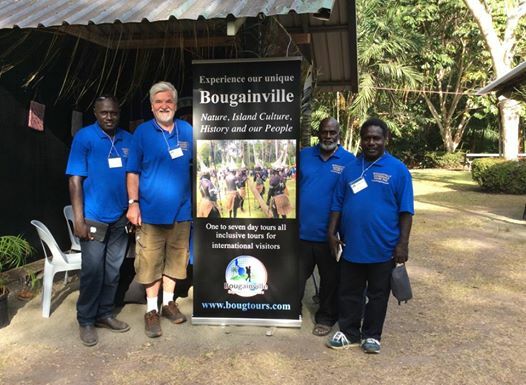 Steven Tamiung stated that according to the villagers, Bougainville Experience Tours is the first and the only tourism consultants that the landowners are engaging to bring tourists to the site. 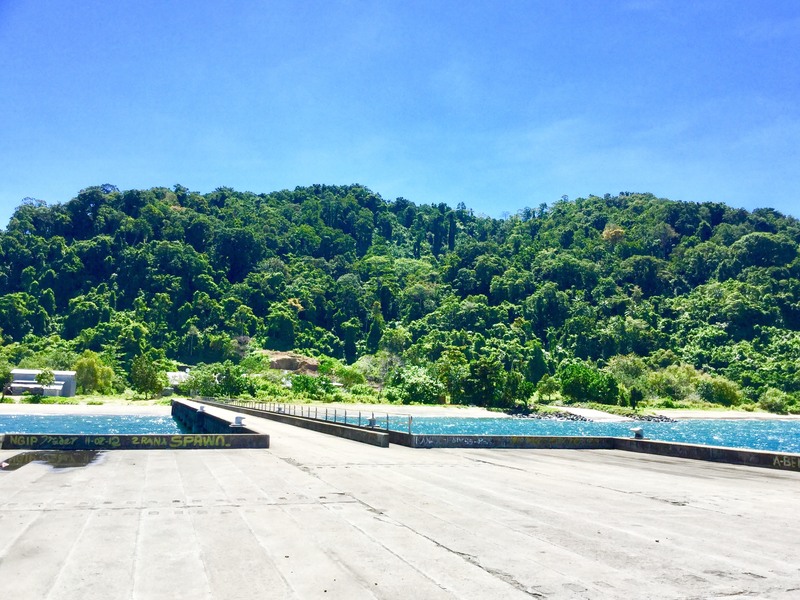 “The landowners are very happy to engage us to help bring in tourist to visit the site,” Mr Tamiung said. 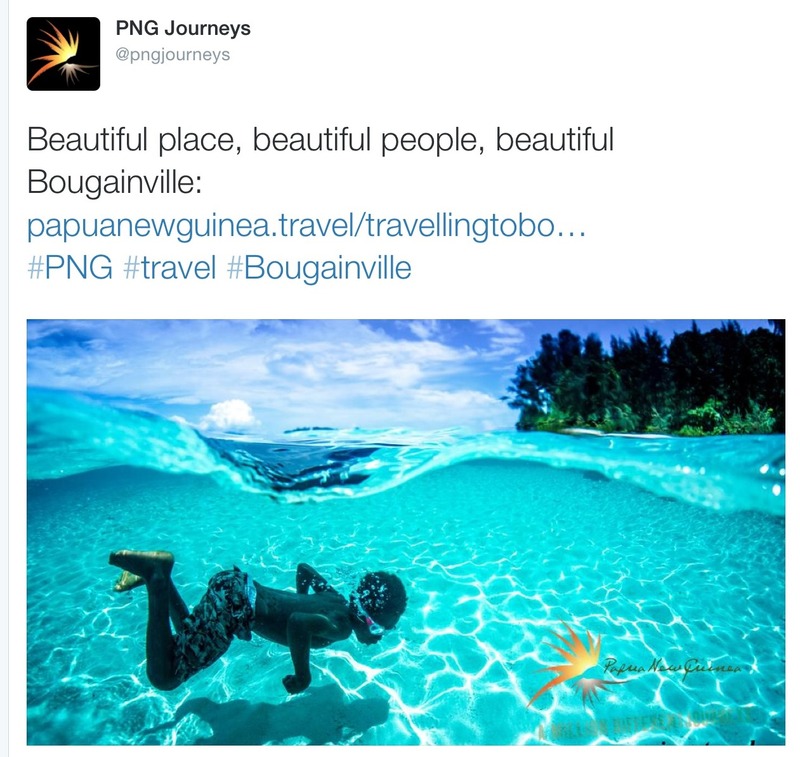 Bougainville Tourism News : Does Bougainville have a 5 year tourism plan ? 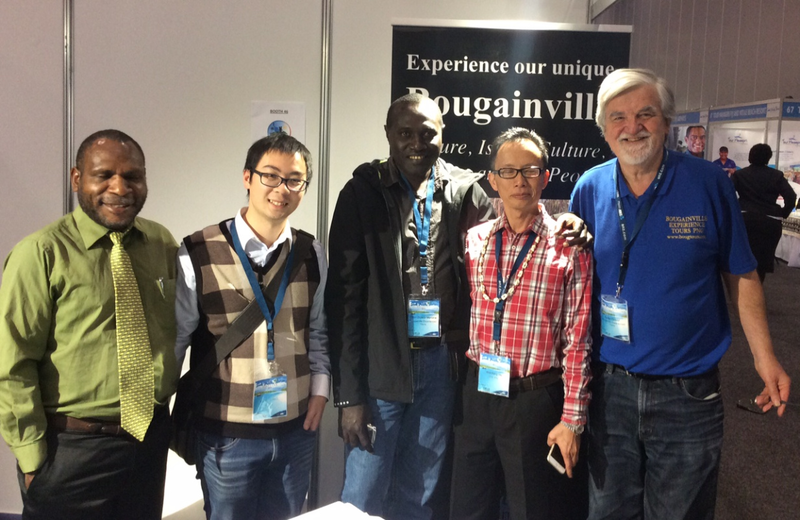 Above: Bougainville’s tourism future ( 2015-2019 ) was recently represented for the first time at an International Tourism Expo in Port Moresby (September 2014) by Zhon Bosco from Bougainville Experience Tours (website ) and his international support team Colin Cowell, Simon Pentanu and James Tanis. 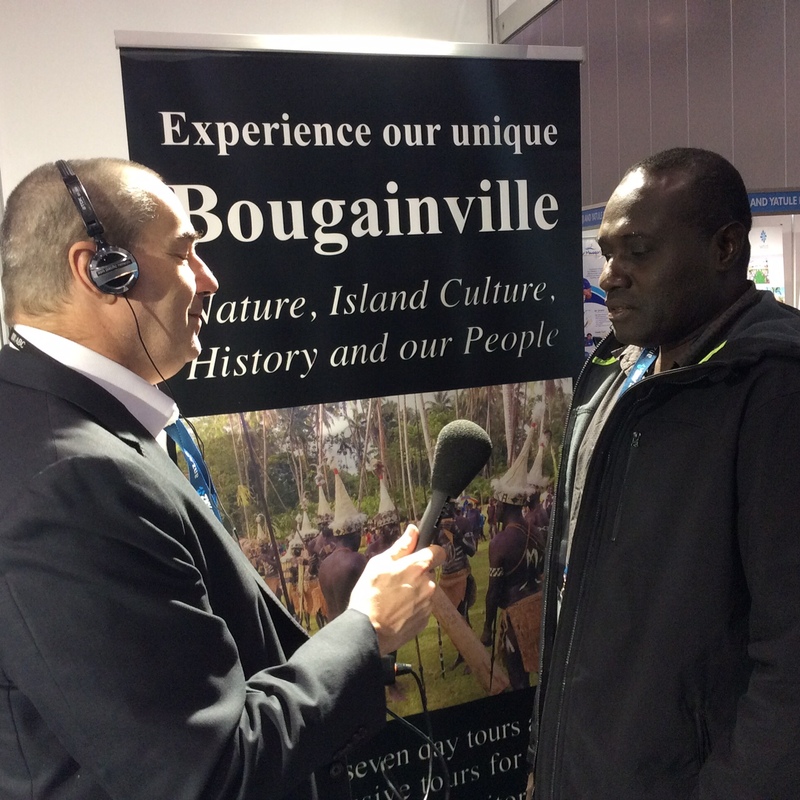 But does Bougainville have a plan to take advantage of the South Pacific tourism opportunities that may occur over the next 5 years ? 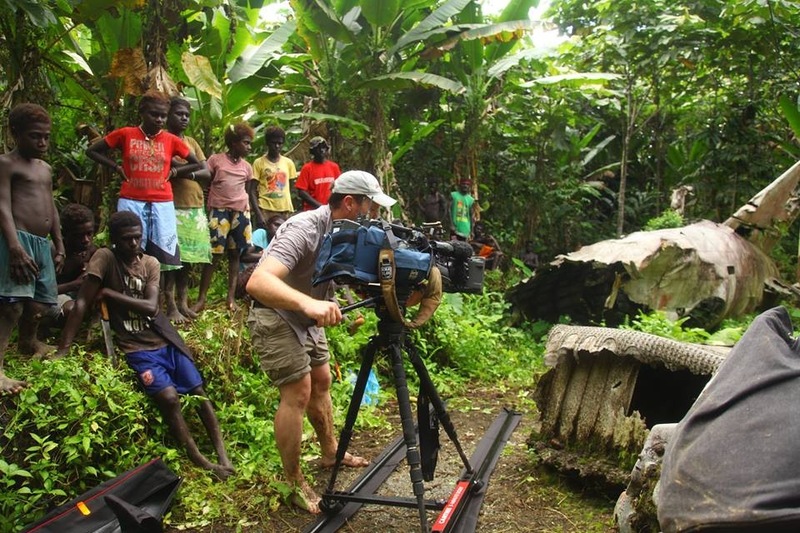 In this report from Radio New Zealand opportunities are explored that will effect Bougainville ? 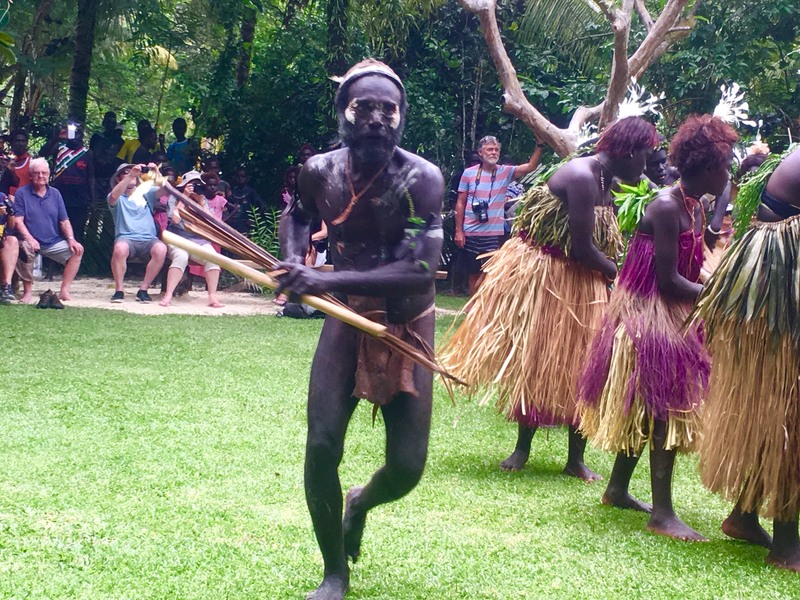 The South Pacific Tourism Organisation is seeking donor and development partnerships to help it implement a five year regional tourism strategy. 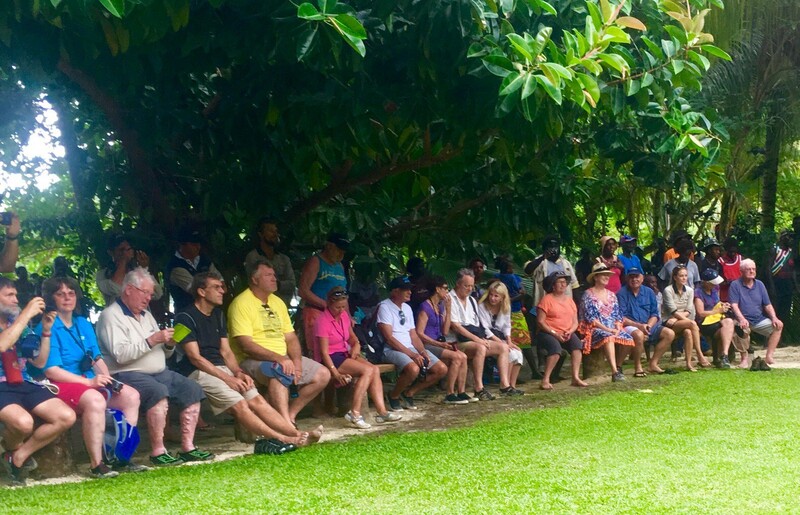 The plan which was approved at the Pacific Tourism Ministers Council meeting last week in Nuku’alofa aims to guide the promotion and development of the industry in the 16 member countries of the SPTO. Its Chief Executive, Ilisoni Vuidreketi, spoke with Koroi Hawkins about the contents of the new strategy. ILISONI VUIDREKETI: We are looking at how we can improve air access and route development, another issue is the cruise ship sector development and we are looking at also, how we can strengthen our marketing program to create more of that Pacific Island visibility in the long haul markets. The other areas that we have looked at is investment in Tourism and product development, research and statistics and of course sustainable tourism planning. 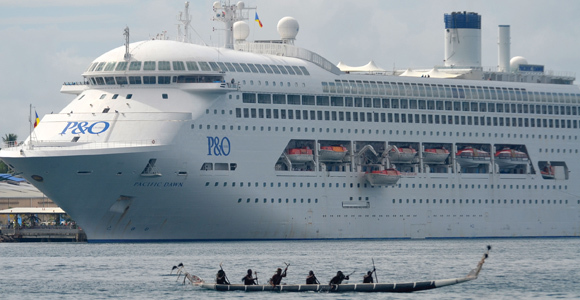 KOROI HAWKINS: In terms of the Cruise Shipping in the Pacific, why is this emerging now? What are the trends that we are seeing? IV: Yea, we are seeing at the global level, the number of ships that are coming out of the docks, new ships, new cruise vessels, its increasing every year and the ships are getting bigger and bigger. 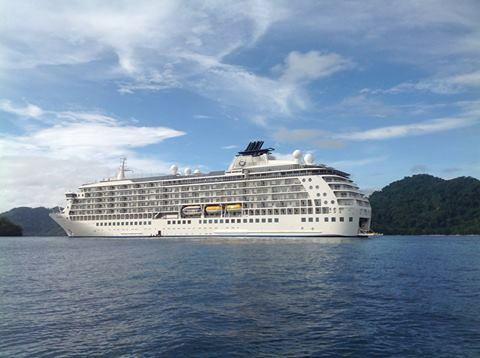 We have cruise liners coming into the Pacific that carry up to 2,000 passengers or 500, 300 for the smaller vessels. No we are looking at ships that are having capacity of up to 4,000 passengers. Now that is certainly something that we cannot accommodate here in the Pacific. But we are looking at the redeployment of the middle sized ships to the other parts of the world and also the trend that we have seen for cruise liners to be looking for new destinations. KH: In terms of funding the Pacific Tourism Strategy, where is the money coming from and how much is it? IV: Sorry I don’t have that figure right now with me. But the programme sets out it is very clear we will certainly be needing the support of development partners. 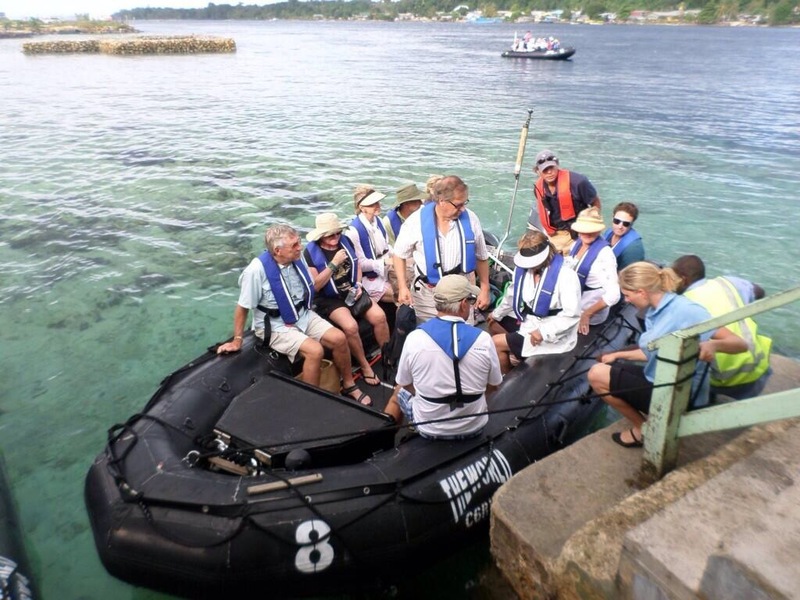 And so the funding that we are looking for is firstly from the contribution of our member governments, which is quite limited when we come to think about this, this big plans for the Pacific. So we are looking at other development partners. That is why we spoke with New Zealand as one of the best options. Also we will be looking at other countries like, perhaps Australia, China and others who may want to be part of this. We are also looking at other donor agencies like the European Union to also pitch in. So it is a collective effort with those, key stakeholders that we have identified.